(Declaration of Independence, 4 July 1776). If politics must truly be at the service of the human person, it follows that it cannot be a slave to the economy and finance. underestimate the difficulty that this involves, but I encourage you in this effort.Here too I think of the march which Martin Luther King, Jr. led from Selma to Montgomery fifty years ago as part of the campaign to fulfill his “dream” of full civil and political rights for African Americans. That dream continues to inspire us all. I am happy that America continues to be, for many, a land of “dreams”. Dreams which lead to action, to participation, to commitment. Dreams which awaken what is deepest and truest in the life of a people. In these times when social concerns are so important, I cannot fail to mention the Servant of God. Dorothy Day, who founded the Catholic Worker Movement. Her social activism, her passion for justice and for the cause of the oppressed, were inspired by the Gospel, her faith, and the example of the saints. In Laudato Si’, I call for a courageous and responsible effort to “redirect our steps” (ibid., 61), and to avert the most serious effects of the environmental deterioration caused by human activity. I am convinced that we can make a difference and I have no doubt that the United States – and this Congress – have an important role to play. Now is the time for courageous actions and strategies, aimed at implementing a “culture of care” (ibid., 231) and “an integrated approach to combating poverty, restoring dignity to the excluded, and at the same time protecting nature” (ibid., 139). “We have the freedom needed to limit and direct technology” (ibid., 112); “to devise intelligent ways of… developing and limiting our power” (ibid., 78); and to put technology “at the service of another type of progress, one which is healthier, more human, more social, more integral” (ibid., 112). In this regard, I am confident that America’s outstanding academic and research institutions can make a vital contribution in the years ahead. A century ago, at the beginning of the Great War, which Pope Benedict XV termed a “pointless slaughter”, another notable American was born: the Cistercian monk Thomas Merton. He remains a source of spiritual inspiration and a guide for many people. In his autobiography he wrote: “I came into the world. Free by nature, in the image of God, I was nevertheless the prisoner of my own violence and my own selfishness, in the image of the world into which I was born. That world was the picture of Hell, full of men like myself, loving God, and yet hating him; born to love him, living instead in fear of hopeless self-contradictory hungers”. Merton was above all a man of prayer, a thinker who challenged the certitudes of his time and opened new horizons for souls and for the Church. He was also a man of dialogue, a promoter of peace between peoples and religions. http://www.greatdreams.com/blog-2014-2/dee-blog689.html. ST. FRANCIS - THE POPESAND CROP CIRCLES. http://www.greatdreams.com/popes/popes.htm. Albert G. Roux, P.O. Box 8, Francis, Maine 04774-0008. ... Jesus said: "My people, I have sent you Pope John Paul II as the pope for the end times. Jun 1, 2014 ... ... on Twitter: Updates From Washington. Twitter. -----. 'Koenig's Eye View from the White House' May 30, 2014. Insight on Pope's Francis trip to . In his vesper's sermon the Pope also turned to the role of the Catholic . ..... Sri Yukteswarji was the direct reincarnation of the catholic saint St. Francis of Assisi. www.greatdreams.com/shroud_of_turin.htm - Similarto IS THE SHROUD OF TURIN OF JESUS? FRANCIS OF ASSISI? ..... Second, only two weeks ago, on his visit to this very city, His Holiness Pope ..... (2) 1207: The Pope's Call for a Languedoc Crusade. Dec 25, 2011 ... Shawnee National Forest - Pope County - This area has seen heavy traffic of foreign military .... Northern New Hampshire - near Lake Francis. He is an Oblate of St Francis De Sales, as well as, a local Spiritual Director. ...... I shall build my church" I spoke these words to Peter, he was My first Pope. Francis J. Aquila. Daniel J. ...... POPE PREPARES FOR DEATH In Australia, home to about five million Catholics, people gathered across the country, including . Peter DaSilva for The New York Times Erik Max Francis started keeping ... The yaramb computer ..... The Pope and the Omphalos Stone at Delphi are related . Her sponsorship of the brothers and sisters of the Order of Saint Francis and Saint Clare is ..... The Pope and the Omphalos Stone at Delphi are related to 153. Shawnee National Forest - Pope County - This area has seen heavy traffic of foreign military equipment .... Northern New Hampshire - near Lake Francis. Sep 18, 2013 ... NOTE: Lightning hit the dome of the Vatican right after the new Pope who represented St. Francis was approved by the other Cardinals. Survivors include children, Francis “Pete” Sanders, Seneca, Linda “Kathy” Curry ...... Djapo; on the "Tamga" of Timurlane and on the coat of arms of the Popes. POPE JOHN PAUL II ... www.greatdreams.com/pope-research.htm - ...... belonging to the exclusive Blancaneaux Lodge resort, owned by filmmaker Francis . betray the Pope. I fully expect George Bush and the FBI to ..... THE WACO FIRE INVESTIGATION ... [Editor's note: Francis is a political appointee of Texas Gov. 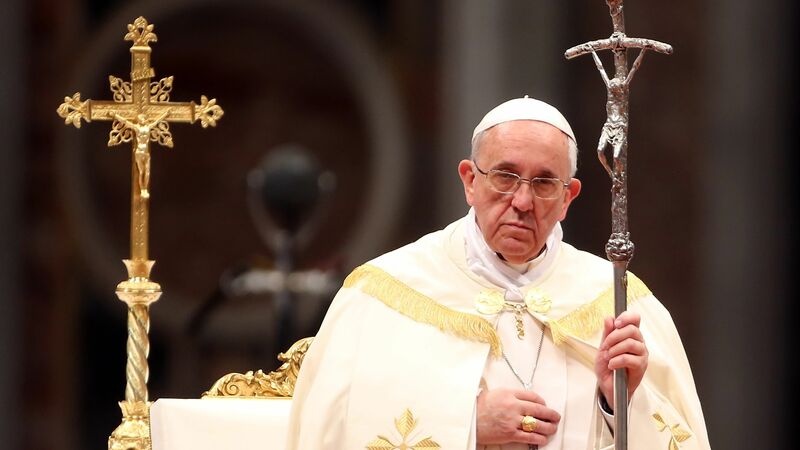 Jul 5, 2015 ... To avoid the approaching calamity, the pope will flee the Vatican. ...... the Golden Ark (Netherlands); International Saint Francis Prize, Fellow; . Nov 26, 2011 ... The first trial had been conducted without reference to the pope; indeed .... 1591, Scotland, Edinburgh, 1, Bothwell, Francis, m, Earl of Bothwell. Sep 11, 2001 ... Jesus said: "My people, I want you to honor St. Frances Xavier Cabrini .... to follow My laws and that of St. Peter's successor, Pope John Paul II.